This was a picture I thought about posting yesterday. Same trip — to Greece and Macedonia — but the look is one I recognize from later years. As Alzheimer’s slowly took her from us, her face became less and less expressive. We could still coax a smile out of her, but it wasn’t the same. 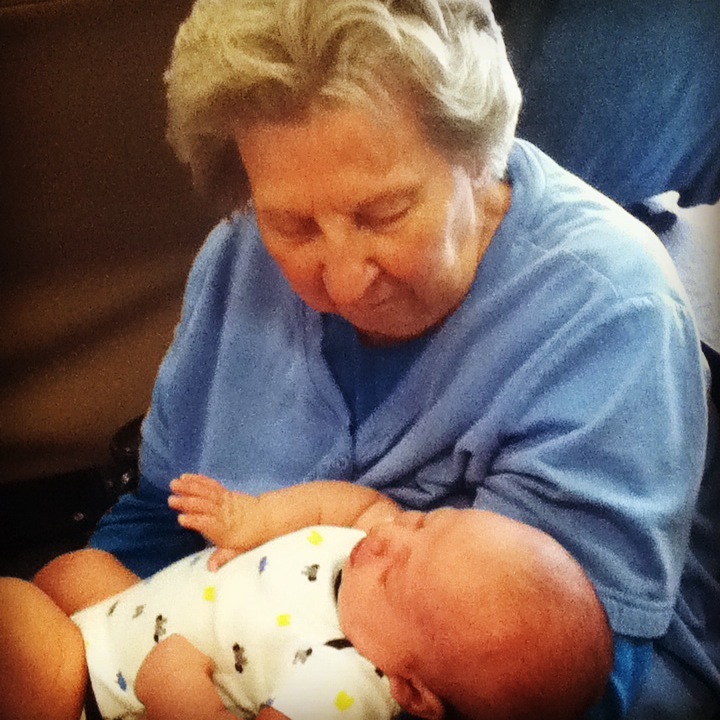 When she first held her great-grandson, she stared and stared. I didn’t think she would ever smile. He was sleeping when we placed him in her arms. His mother and father hovered, hands ready to catch the precious cargo should she forget what she was doing. 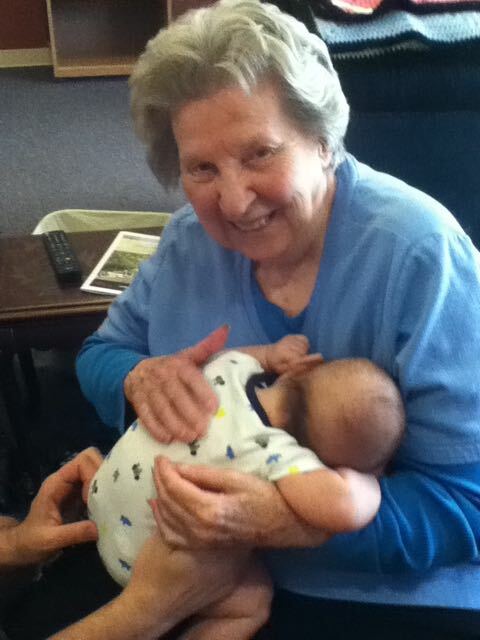 We told her over and over that this was her great-grandson. Other women residents in the nursing home moved closer, wanting to see, wanting to touch this new life. Perhaps some youth would rub off on them. But we tried to keep this as her moment. It was, after all, her lineage. Her family. Finally, the baby squirmed — parent hands moved in closer to avert potential disaster — and turned his head toward her breast. She smiled a real smile that reached her eyes. So I look at that travel picture of my mother sitting on a bench, alone, slightly lost — and I know that trip was a milestone, but not in the good sense. It’s almost like we were at the base of Heartbreak Hill — and we were about to tackle the toughest part of the course. But we didn’t fully comprehend it at the time. And that’s the trouble. I DO comprehend it now. I’m not ready to do it again. But my father forgot someone yesterday, a person that he had known well for many years but yesterday he had no recollection of her at all. So, if I feel a little panicked about this trip to Normandy, it’s because I’m thinking of this other journey that I’m on. What’s that cheesy saying? “Each day is a gift. That’s why we call it the present.” Sometimes cheesy is good and true. Oh my dear. That touches and ignites a heart. You will never be ready to do this again (why the hell should you have to do this again …. World! Understand that dealing with dementia is the lowest a child has to go. Cancer. Yes, Heart disease and all the other skulking beasts we know. Dreadful. But this thing we call Dementia. It’s the pits too. The pits of disparu. I wish you bon courage. Do this thing. I wish I could help. If I can (I’m in France and she is large but I could) then holla out. What you do is a wonderful thing. There will be a moment on your daddy’s face that replicate your mummy’s moment of embracing total recognition in her Grandy. I know it. Because I do. All shall be well as Sister Juliet of Norwich promised. And I, for my sins do too. In simple human kind. I guess for lack of a better term, the illness takes something of the spark out of a person, slowly but surely. These images are so poignant, thank you for sharing. 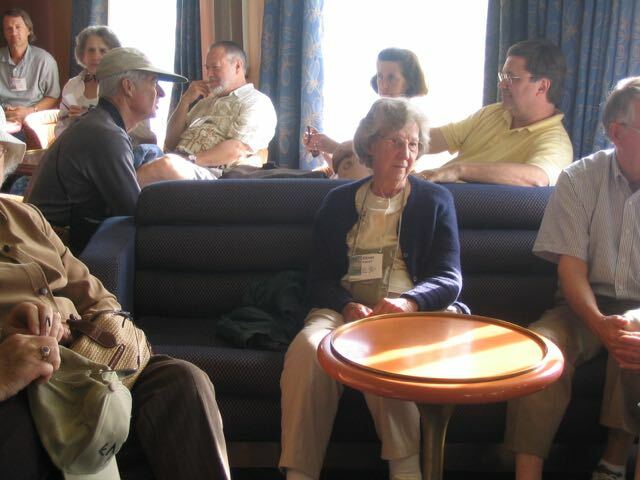 That lost look is one that dementia caregivers recognize all too well. It is understandable that there is some anxiety and concern about the upcoming trip. At least you are going into the trip with eyes wide open and with the knowledge of what your mother experienced. And yes, by all means, enjoy the present moment.